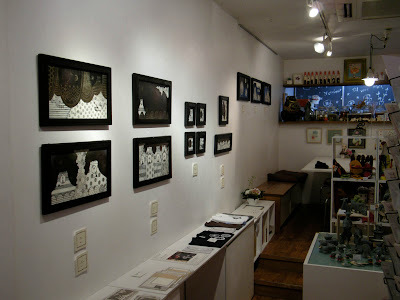 In the bubbling area of Horie, Osaka, there's a very good Zakka and Exhibition space called Art House. I've always walked past it, but never gone in. I've always been shy. I'm naturally shy. I'm a shy guy. Art house is cool for a number of reasons. Of course it has it's own network of artists and illustrators, but it's also the product of it's own network. 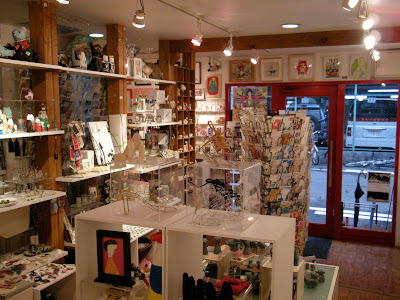 All of the Zakka items for sale inside are the products of the artists. If you've been to a Zakka you'll know what to expect (it translates roughly as 'variety store' in English, but that explanation DOES NOT do it justice). There's 2 exhibition spaces, the left hand wall of the shop, which you can see in the picture above (or below), and on the 2nd floor there's a whole room. Apparently they have ukulele lesson there too! Running the shop is a very nice lady called Yoshitake San. I had a good chat with her, she's very friendly and keen to promote all that's going on. 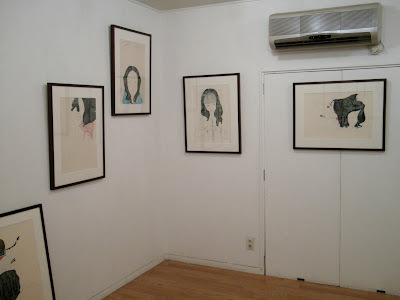 On the 1st floor, I saw Mayko Yoshimoto's exhibition, 'Sincerely Yours'. She's got some pretty cool stuff. 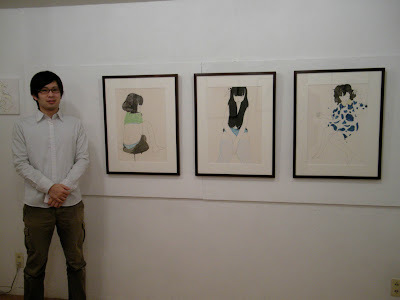 Climbing the stairs, I found myself in the 2nd floor gallery speaking to Yutaka Miyashita • 宮下裕生. He's a nice young lad. Pictures of young girls, draw in outline. The coolest thing was the prints of the hair and sometimes clothing, which almost seemed like woodblock prints. The dark areas of these prints contrasted with the thin lines of the drawing. Composition was good. Miyashita San said he wasn't an illustrator or an artist, or a designer... Just a guy who liked to do this stuff. You know I notice that in Japan the lines between of illustration, art and design are more blurred than they are in Australia. In Australia, people usually say with no hesitation what they are, but In Japan, the more people I speak to, the more people just tell me what they do. There's less focus on the profession and more on the results of it. I like that. I find myself following these lines. He told me that he's just wrapping up university, and will be looking for a job soon. I wished him the best of luck. 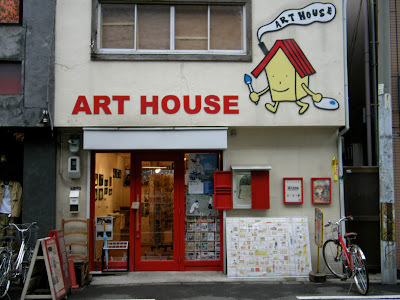 Next time you're in Horie, you should drop past Art House and checkout the place, it's well worth the visit!